There is a brand, sparking new linking in town! Inspiration struck the lovely Mum of One so now we are ready to parteeeee! 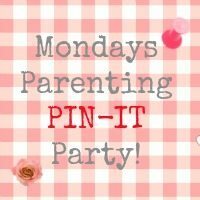 Every Monday there will be a different host for you to pin and share your parenting posts with; so come on get pinning. Jenny from Mum of One who is kicking it all off today of course. Honk honk! Loving this linky already – I’ve found new folk to follow and got new followers back!